Tsi Fly's name is a misnomer as she grows short with tight internodes spacing and has long branches. Tsi Fly is the result of combining a C4 female with a Cinderella 99 male, and then backcrossing one generation. This genetic combination gives rise to a smaller bushy plant that is quite branchy. Above average yield of tight golf ball sized buds that form long colas. This strain has very little stretch in flowering and so is good for areas with low headroom. The average plant height ends at 2.5-3.5 feet. Tsi Fly is very easy to grow and clone and produces buds with apricot flavours. 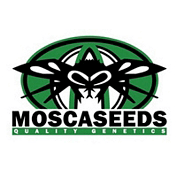 Get a pack of 3 Azucar seeds for FREE with every Mosca Seeds pack purchased. Buy 1, get 1 free! Criada usando o melhor da genética dos EUA, Mosca Seeds é um novo banco de sementes cuja popularidade está constantemente crescendo. Produzindo principalmente híbridos de Indica e Skunk, Mosca Seeds criaram uma grande reputação em um curto espaço de tempo com a qualidade de suas variedades. Compre Mosca Seeds de Seedsman hoje e descubra porque eles conseguiram tantos seguidores nos sites de sementes de marijuana.